Sweet, gentle, loving little Annie was humanely euthanized by Dr. Debra Scheenstra a little after midnight. Annie had progressive, major dental abscesses that were untreatable. She declined rapidly today and was suffering due to extreme neurological reactions. We sadly decided to let her go. We are very grateful to Sophia, Annie's foster mom and to Dr, Debra for her compassion and care. Annie came to us after she had been dumped at a vet's office with major dental disease. It's been a constant battle to help her. Expensive, invasive and always fraught with uncertainty. We did what we could to give Annie love and a good quality of life. She may have had a sad start in life with people who abandoned her, but we were determined to let her know that she mattered and was deeply loved. If you would like to make a donation in Annie's memory to help us cover some of her veterinary bills, that would be very helpful and greatly appreciated. We will also make sure that Ralph is taken care of after losing his beloved mate. Hi.My name is Ralph and I love with my girlfriend Annie, also a special needs rabbit. I am skeptical about humans and what they have to offer me. Despite my incredible cuteness, I am considered "special needs", because I have deep-seated behavioral issues, that may not ever fully resolve. I am unpredictable and can be somewhat friendly, then reach out to nip or bite without warning. I am really appropriate only for a very patient and experienced bunny lover who loves me just the way I am. My early life was spent as a "stud bunny" at a breeder's in Sacramento. The only handling I ever got was to be put in a cage with a female to mate. Yeah, it was fun for a few moments, but then I got shut back in my filthy cage for the rest of the time. I was confiscated by Animal Control and wound up at Marin Humane Society, where I did not pass my behavioral evaluation for adoptions. Right now, the only person I like is my foster mom, Marcy at SaveABunny. Even with her I can be cranky. I just can't help myself. However, I do really like my bunny, Annie and we must be adopted together. What Annie and I would really like is to find a forever home with someone who is patient, compassionate and loves "as-is" bunnies. Annie is a very small, spayed dwarf girl with elegant Siamese type markings. Her ivory fur and rich cocoa colored paws and points give her the sophisticated look of a movie star. Maybe they could make a film "Bunnies At Tiffany's" with us? Annie came to SaveABunny after being abandoned at a veterinarian's office with major dental issues and a sniffily nose. She has needed extensive surgery for dental problems with her back teeth, as well as a jaw abscess. 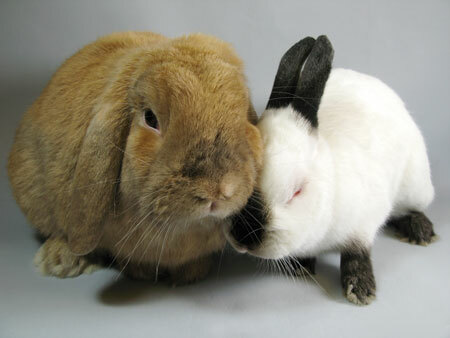 Both of us are special needs rabbits and need to love our lives with an experienced bunny lover who has the time, patience and financial resources to give us the love and special care we need. We were both saved from abandonment and neglect, and then euthanasia at local shelters. Please help SaveABunny help us!